Grzegorz Wroblewski – Deuter Kelner. Post punk visual poetry coasters. 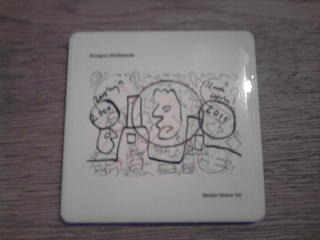 Each coaster measures 9cm x 9cm. Please email mail@zimzalla.co.uk for details. Grzegorz Wróblewski, born in1962 in Gdansk and raised in Warsaw, has been living inCopenhagen since 1985. He has published nine volumes of poetry and two collections of short prose pieces inPoland; three books of poetry, a book of poetic prose and an experimental novel (translations) inDenmark; and a book of selected poems in Bosnia-Herzegovina, as well as a selection of plays. His work has been translated into ten languages. and in the following anthologies: Altered State: The New Polish Poetry (Arc Publications, Todmorden, UK 2003), Carnivorous Boy Carnivorous Bird (Zephyr Press, Brookline, USA 2004), A Generation Defining Itself – In Our Own Words (MW Enterprises, USA 2007). Selected poems Our Flying Objects (Equipage Press, Cambridge, UK 2007), new and selected poems A Marzipan Factory (Otoliths, Rockhampton, Australia 2010).